I meant to start this last week, but the first week of January proved to be sickly and stressful. We are all currently healthy, and I'm starting to make progress on my to-do list. So, this is a week late, but will last a full month. In February, there will be a slight overlap. 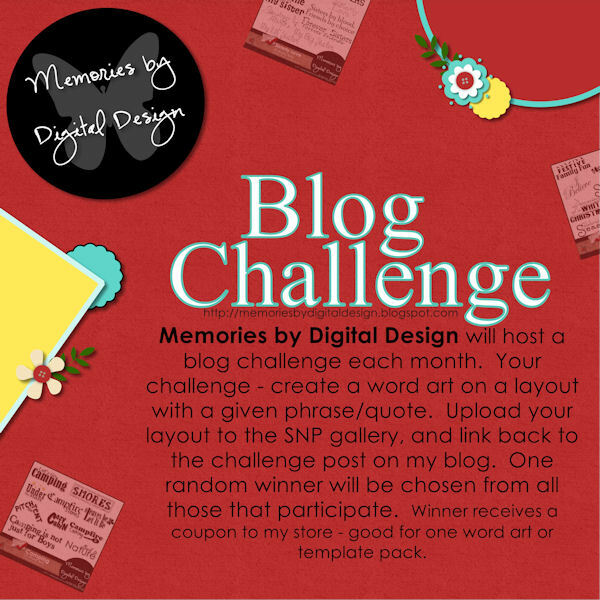 My blog challenges will work like this - create a word art on a layout from a given phrase or quote. Upload your layout to the SNP gallery, and link back to the challenge post here. One random winner will be chosen from all those that participate. Winner will receive a coupon to my store - good for one word art or template pack. You can use the quote in its entirety or parts for a phrase word art. I'm looking forward to seeing what you come up with. Link your layout from the SNP gallery to this post by 2/8/2012 to be considered for the monthly prize.